Charles Barkla won the 1917 Nobel Prize in Physics for showing that X-rays emitted by any substance are related solely to the chemical elements present in the substance. This means the emitted X-rays act as a form of fingerprinting to identify which elements are present in any material. Began a study of X-rays in 1902. This form of radiation was still poorly understood following its discovery in 1895 by Wilhelm Röntgen in Würzburg, Germany. Used the scattering of X-rays by elements to prove for the first time that the number of electrons in a neutral atom is identical to its atomic number. Provided strong evidence that X-rays are part of the electromagnetic spectrum when he established that X-rays can be polarized. Found that exposure to incoming X-rays causes atoms to emit their own characteristic X-rays. The energies of these characteristic X-rays are unique to the chemical element emitting them. In other words, every chemical element has its own unique X-ray emission spectrum. Robert Bunsen and Gustav Kirchoff established a similar result for visible light in 1860. Today we would say that when Barkla exposed atoms to X-rays, the incoming X-rays ejected electrons from the atoms’ innermost electron shells. Outer shell electrons then dropped into the vacant inner shells, releasing energy in the form of the characteristic X-rays Barkla observed. Coined the terms K and L to indicate the energy levels of X-rays emitted by atoms. K is taken from the word kernel referring to the innermost energy shell. The highest energy characteristic X-rays are emitted when electrons fall into this shell. An interest in Barkla’s work prompted Arthur Compton to carry out the X-ray experiments that led to his discovery of the photon. Charles Glover Barkla was born to middle class parents in Widnes, England, UK. His father was John Martin Barkla, a manager with the Atlas Chemical Company. His mother was Sarah Glover, the daughter of a watchmaker. 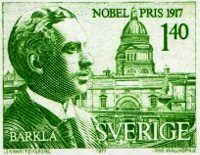 Sweden issued a stamp in honor of Barkla in 1977, a century after his birth. Barkla was educated at a grammar school, Liverpool Institute High School, from which he won a scholarship to Liverpool University, about 10 miles from home. He studied Mathematics and Physics, graduating with a first class honors degree in Physics in 1898, followed by a Master’s degree in Physics in 1899. In 1899, age 22, he began postgraduate work at the University of Cambridge’s Cavendish Laboratory studying electromagnetic waves. His supervisor was J. J. Thomson, the discoverer of the electron. In 1902, Barkla began his Nobel Prize winning work at the Cavendish Laboratory. He completed it at Liverpool University, where he moved in 1903. Barkla was awarded a Bachelor of Arts research degree by Cambridge in 1903, and a DSc by Liverpool in 1904. 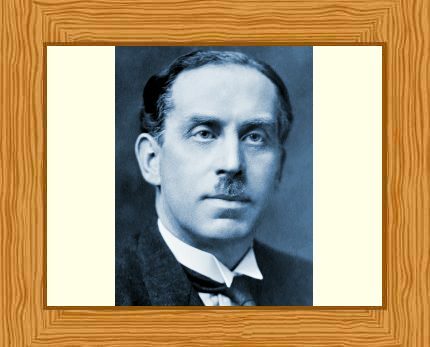 In 1909, with the widespread recognition of his X-ray work’s importance, Barkla was appointed Wheatstone Professor of Physics at the University of London. In 1913, age 36, he became Professor of Natural Philosophy at the University of Edinburgh. He remained in this position until his death. Barkla was a committed Christian – a Methodist. He regarded his scientific work as part of his personal quest for God. He had an excellent bass singing voice and sang in the chapel choir at King’s College, Cambridge. Barkla married Mary Esther Cowell in 1907. They had a daughter and two sons. Charles Glover Barkla died, aged 67, at home in Edinburgh, Scotland, UK on October 23, 1944. His youngest son, Flight Lieutenant Michael Barkla had been killed the previous year in an accident in North Africa, where he was working as a surgeon during World War 2. Images digitally enhanced and colorized by this website. © All rights reserved. "Charles Barkla." Famous Scientists. famousscientists.org. 14 Mar. 2018. Web. Was Archimedes’ Father Really an Astronomer? Einstein did NOT say that!